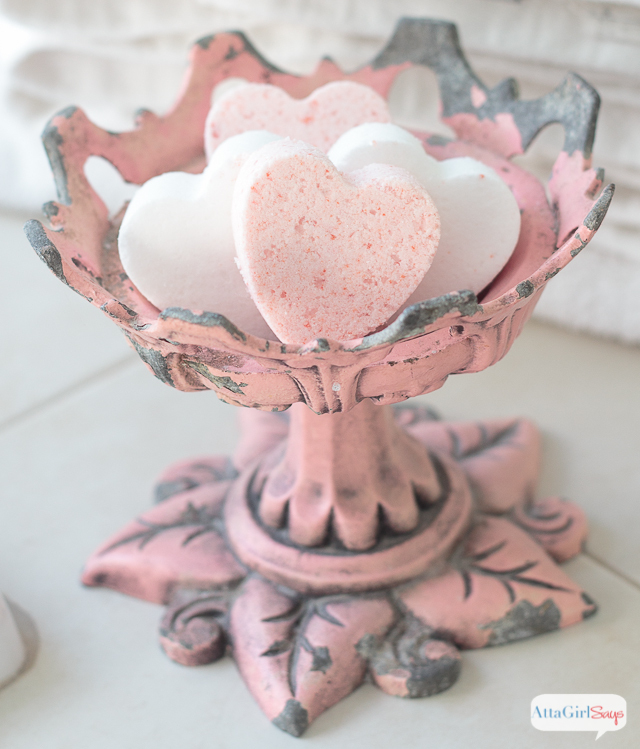 These heart-shaped homemade bath bombs are scented with jasmine and sandalwood, and they make the perfect Valentine’s Day gift. The first time I ever heard of bath bombs was on our honeymoon, when our sightseeing took us into a luxurious bath shop. 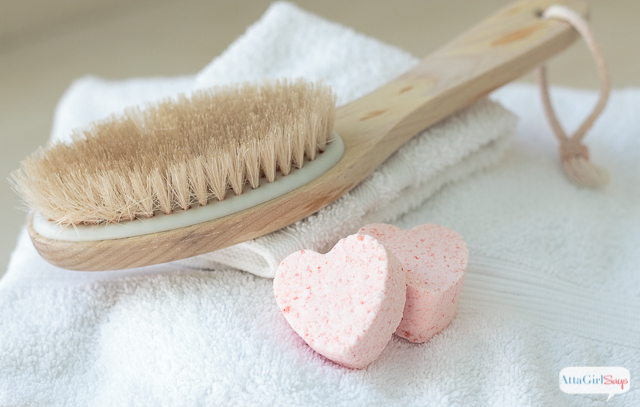 My new husband treated me to all kinds of fancy bath products to take home — so sweet. 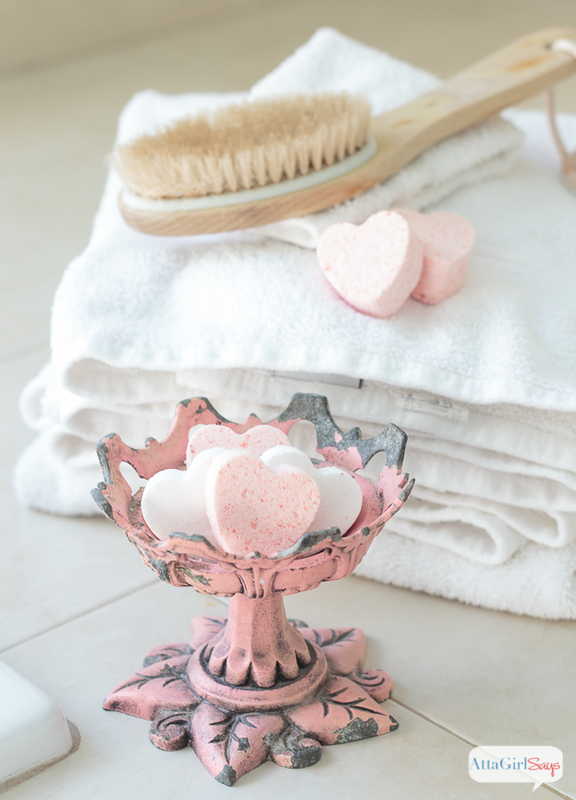 These heart-shaped homemade bath bombs are every bit as luxurious, but at a fraction of the cost! Disclosure: This post contains affiliate links for your shopping convenience. If you make a purchase from my referral, I earn a small commission, at no additional cost to you. Read my full disclosure policy here. 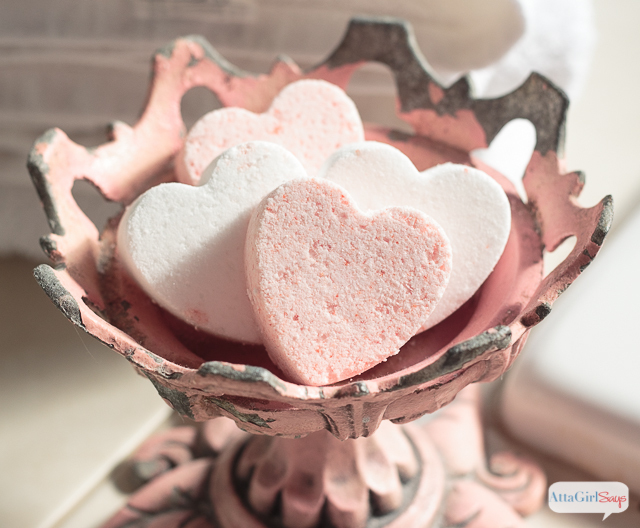 For Valentine’s Day, I decided to make some heart-shaped homemade bath boms scented with Love Potion essential oil, a combination of jasmine and sandalwood. 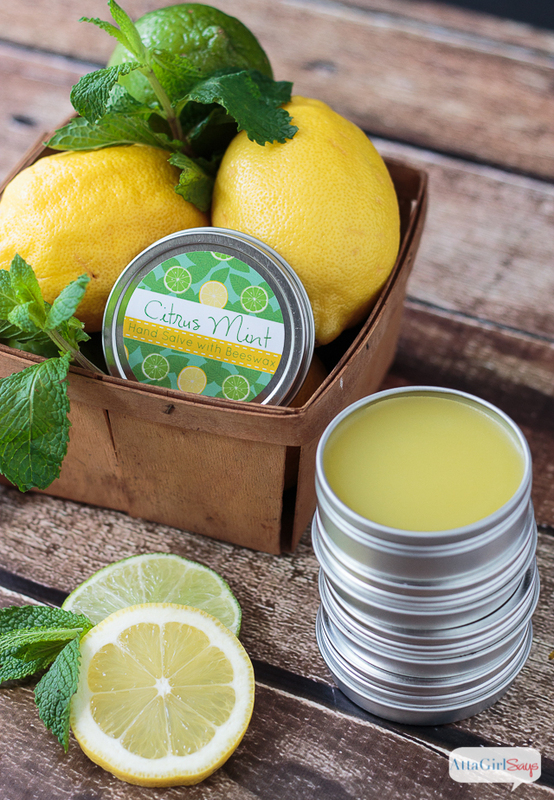 Drop one of these in the bath for a luxurious soak that will leave your skin moisturized and fragrant. I’m excited to be sharing the recipe for these homemade bath bombs as part of this month’s Celebrations of Home blog hop with some of my very favorite creative ladies. Every month, we share seasonal crafts, DIY, decorating ideas and recipes to inspire you. This month, we are featuring ideas for Valentine’s Day. I had heard some craft-fail horror stories from others who have tried to make DIY bath bombs, so I put off trying it myself. But after talking to some fellow crafters and reading up on the dos and don’ts of homemade bath bombs at Soap Queen, I gathered up my ingredients and mixed up a batch. Love Potion, Sweet Orange, Vanilla bath bombs, shaped like hearts and snowflakes and Lego minifigures — we’ve gone a bit bath bomb crazy around here. I might just be a tiny bit obsessed with homemade bath bombs now. 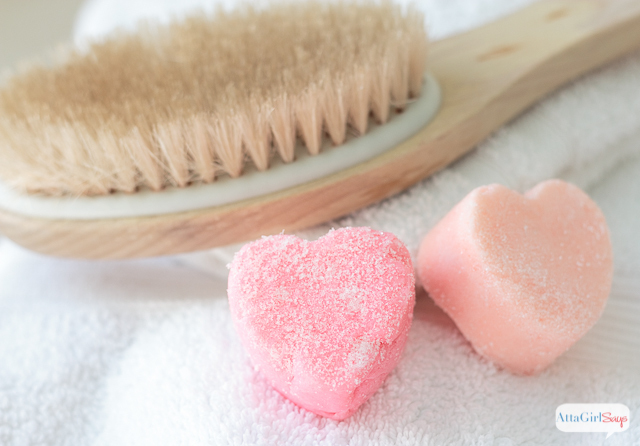 To make your own Love Potion homemade bath bombs, you will need the following supplies. Place a mesh strainer over a large bowl and pour in 1 cup of baking soda, 1/2 cup citric acid and 1/4 cup of fine epsom salts. Sift to remove any lumps. If you’re unable to find fine epsom salt, put it in a food processor or blender and pulse until fine. Stir baking soda, citric acid and epsom salts until well blended, making sure there are no lumps. Next, slowly add 1/2 Tablespoon of jojoba oil to the dry mixture. 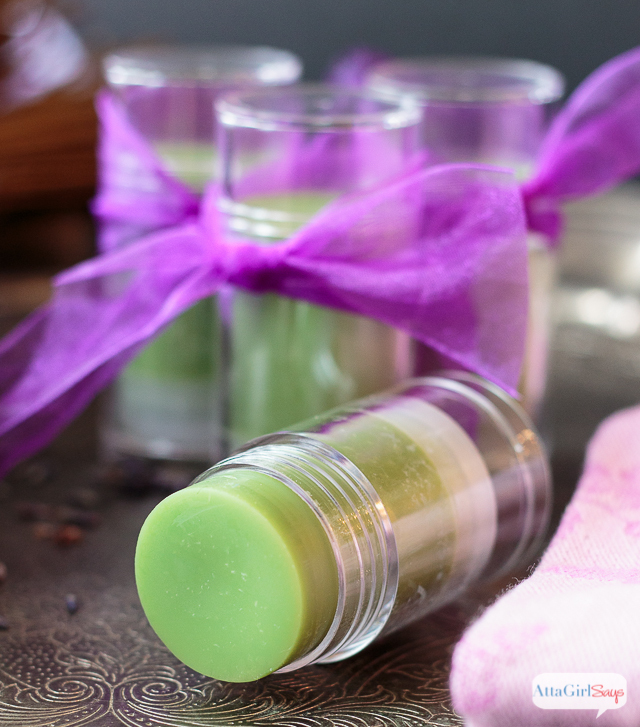 Add 10 drops of Love Potion essential oil and 1-2 drops of food coloring. Wearing plastic gloves, mix the oils and food coloring through the dry mixture, until it is well incorporated and pink. Once mixture is blended, slowly add witch hazel, one spritz at a time, until the bath bomb mixture sticks together when squeezed. You’ll need about 8 to 10 spritzes of witch hazel to get the right consistency. The mixture should not be crumbly. It should stick together when squeezed, but you don’t want it too wet or it may begin to fizz. Allow to dry for several hours, or ideally overnight, then remove the homemade bath bombs from the molds. They should be very hard when you remove them from the molds. Wrap bath bombs tightly in plastic wrap and store in a cool, dry place, away from any moisture. If you want to make larger bath bombs, you may want to use these heart-shaped silicon cupcake baking cups. If you run into any issues when making your bath bombs, definitely check out the Bath Bomb Questions & Answers post on Soap Queen. That really helped me anticipate and prevent any problems. I also made these bath bombs in sweet orange and vanilla scents. For the sweet orange bath bombs, I followed the same recipe, but substituted Sweet Orange essential oil for the Love Potion, and colored them with a drop each of orange and yellow food coloring. 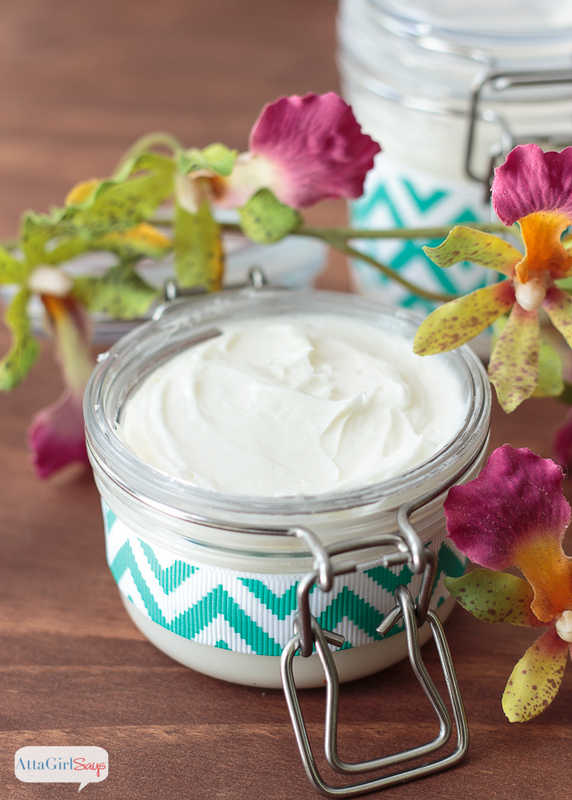 You may switch out the regular jojoba oil for use vanilla-infused jojoba oil to add more depth of fragrance. You could also use a few drops of vanilla absolute or vanilla oleoresin, in combination with the sweet orange essential oil. But keep in mind that this will leave brown flecks in your homemade bath bombs. For the white vanilla-scented heart bath bombs, I substituted 1/2 Tablespoon of vanilla perfumed oil from The Body Shop for the jojoba oil. (The oil I used isn’t available anymore, but it is similar to this vanilla body oil.) I didn’t add any more essential oil scent to these bath bombs, just skipped straight ahead to spritzing the mixture with witch hazel. My kitchen has turned into a regular bath shop lately. 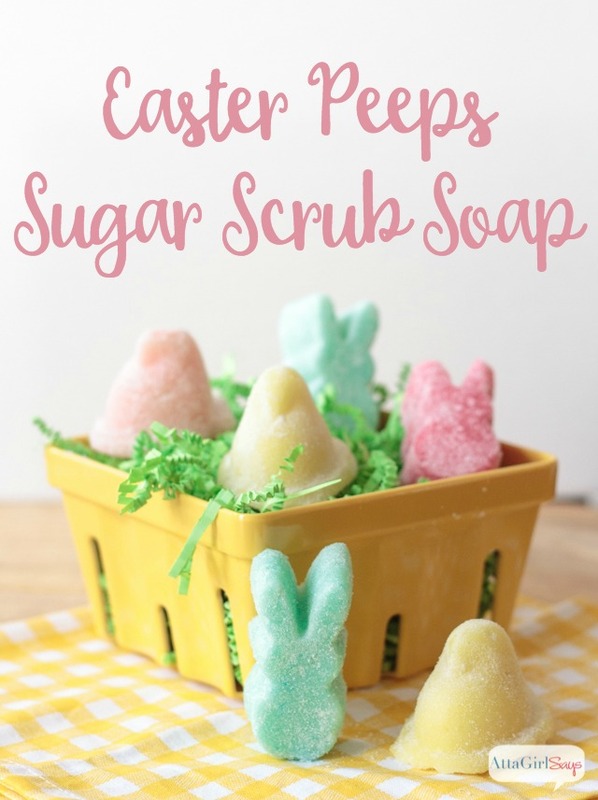 In addition to these homemade bath bombs, I’ve also been making some sugar scrub soaps. 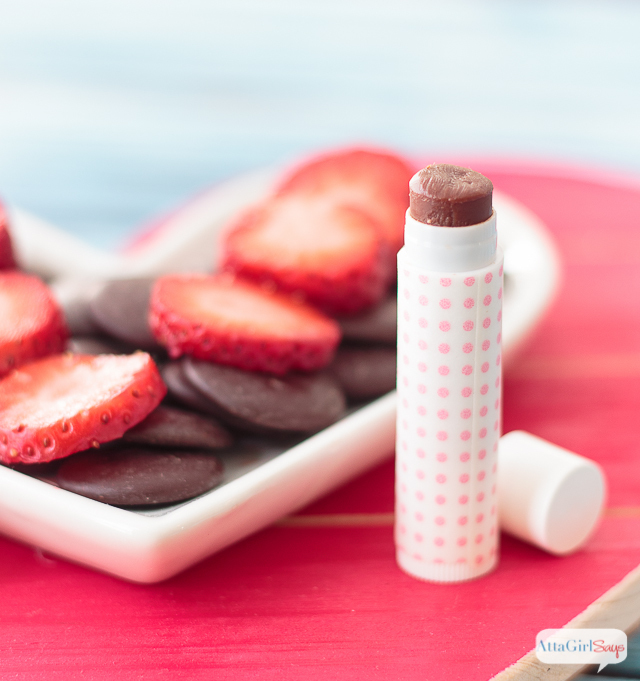 Don’t miss these other Valentine’s Day projects from the Celebrations of Home bloggers. I have always wanted to make these. Thanks for sharing the how to!!! So pretty for a gift! Wow – these look and sound amazing! I’ve always wanted to try my hand at making some these. They would make a wonderful gift for so many different occasions. Your grands would have a blast making them with you. Cannot wait to make some!! I have always wanted to try and make bath bombs! These are perfect! 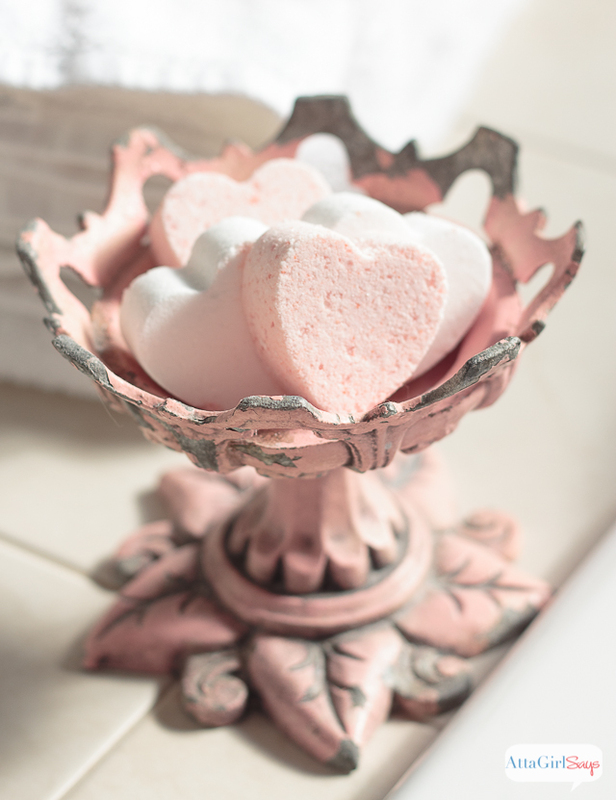 Thanks Amy for sharing your bath bombs and Cinnamon Sugar Pie this week on #OMHGFF. Oh these are so precious I will have to try and make a batch for sure! Those are so cute!! I love Bath bombs and I might make some just for myself and give myself an evening with a nice relaxing bath with a bottle of wine! 😀 Pinning! These bath bombs look so beautiful and sweet! They are being featured this week at Craft Frenzy Friday at Mom Home Guide!